One of the more interesting developments in Week Eleven in the NFL that went largely unnoticed, was that Buffalo Bills’ rookie quarterback, E.J. Manuel had the best game of his young career. Manuel assisted his team in landing a big upset win over the division rival New York Jets, who are firmly in the race for a playoff spot. What is even more fascinating is that Manuel’s best game was coming right on the heels of arguably his worst game as a professional. Manuel was dreadful in the Bills’ Week Ten road loss to the Steelers; Manuel’s first game back from missing several games with a knee injury. How did he play differently in both games, why was Manuel able to improve so drastically from one week to another? How can the Bills assure they see more of the Week Eleven version of Manuel? Let’s take a look through the eye in the sky to find out. Manuel had a brutal day against the Steelers and any one could see that. He was inaccurate, failed to move the chains, and made a ton of bad decisions. Any average fan watching this game could tell you those things. In this instance, it is more important examine to look in depth at what Manuel did not do, instead of what he did do on the field. The passing chart breaks down the field into four layers: behind the line of scrimmage, short (0-10 yards), intermediate (11-19), and deep (20 or more yards). The passing chart also shows whether a throw was made to the outside left, middle, or outside right area of the field. As the chart shows, Manuel attempted most of his passes to in the short area of the field, or zero to ten yards from the line of scrimmage; a whopping 77% of his throws to be exact. This was probably a concerted effort by the head coach, Doug Marrone and offensive coordinator, Nathaniel Hackett, to make sure Manuel, a rookie who had just missed over month of action, was comfortable in his return to the field. Manuel just throws the short completion to Johnson, and pretty inaccurately too. You can also see just how badly Cortez Allen was cheating up on this play as he is already sprinting up to take down Johnson before the ball even arrives. Though it is a safe choice, with Johnson trailed by the slot corner, and Allen coming up field, there just was not a ton of upside in throwing to Johnson. That is not the case with Graham. If Manuel has been able to lure Allen up the field, Graham would have been all alone down the sideline; no way the safety gets deep enough, or over in time to prevent a catch. Even with time in the pocket, Manuel just never considered, or saw this option. 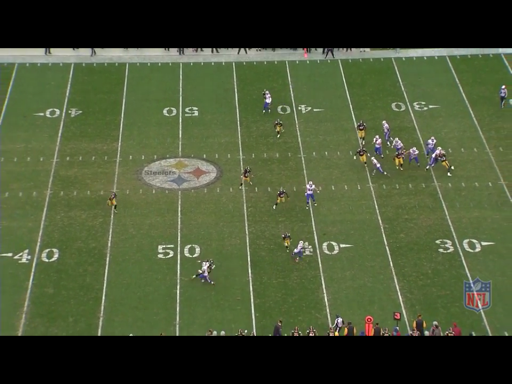 This play illustrates one instance of many where Manuel refused to looks down field against the Steelers, and took a number of safe throws short of the first down markers resulting in an alarmingly low 3.97 yards per attempt. Even on the two times Manuel did throw deep down the field, his footwork showed no confidence, and he inaccurately fired both passes way out of reach of his intended receiver, and even threw one right to a Steelers defender. Manuel could not get into a rhythm and subsequently had no confidence in his passing ability in his first game back from the injury; this represented the most notable contrast between his worst, and best game of the year. What a difference a week can make. E.J. Manuel looked like a completely different quarterback against the Jets in Week Eleven. Manuel looked every bit the big, strong, physically gifted prospect he was billed to be coming out of Florida State. He cut through the strong winds blowing through upstate New York on Sunday to throw some really strong deep balls. Interestingly enough, the Bills coaching staff came out with a similar game plan to what they showed against the Steelers. The plan was to once again get Manuel into a rhythm with some easy completions in the opening portions of the game. The passing chart shows that Manuel threw eleven of his twenty-eight attempts into the short right area of the field. On film you notice Manuel continually make those throws, especially in the first half. 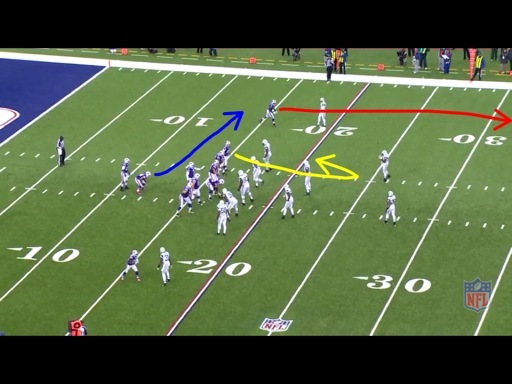 Clearly with the intention of avoiding the Jets fierce defensive line crashing down on the rookie quarterback early, Doug Marrone and Nathaniel Hackett frequently had Manuel drop back, make one read to the short right area of the field, and get the ball out quickly to that receiver. Manuel repaid their efforts by being decisive and completing 82% of those throws. Manuel drops this ball right into the bucket and the result is a huge gain for his team. Brimming with confidence, Manuel comes out on the very next play and launches another deep ball right down the sideline that does for a long touchdown to rookie Marquis Goodwin. That was the biggest difference between Manuel’s worst game of the season against the Steelers, and his best game of the season versus the Jets. Against the Jets the plan to work him into a rhythm worked to perfection, and gave the rookie the confidence he needed to be ready and willing to pull the trigger on the deep ball against a weak Jets secondary. E.J. Manuel has the physical ability to consistently make these type of big plays week in and week out. The key for the Bills will be to continue to foster his growth so we can see it more often. Antonio Cromartie had been duped enough on those plays in the early portions of the game that by this time he knew to just sit on the short routes. Cromartie breaks on the ball, and if he had managed to catch the pass, there is no doubt this play is going to end in six points for the Jets. The Bills have to be careful not to make things so easy on, and predictable for, E.J. Manuel when trying to get him into a rhythm that it tips off the other team. 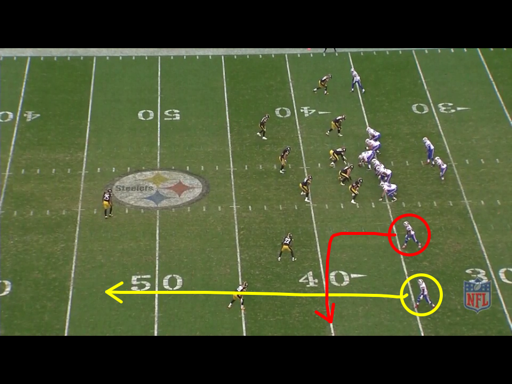 You better believe that if Rex Ryan and his staff were able to key on it during the game, that every coach that plays the Bills the rest of the season will be showing their defensive players this game film and prepare them to exploit it as Cromartie came so close to doing. The Bills have found a winning strategy that Manuel clearly feels comfortable and confident in. The key is to now diversify that strategy just enough so that it becomes something that defensive coordinators cannot easily prepare for, while still accomplishing the goal of getting Manuel into that early rhythm with the goal of taking deep shots against favorable looks. E.J. Manuel showed great poise and professionalism by doing something young players rarely do, following his worst performance with his best. Most young players, especially quarterbacks, have a tendency to go through stretches of poor play when they hit a wall like Manuel did against the Steelers. Credit the coaching staff with a great plan to get their rookie starter back on track, and credit E.J. Manuel with responding in such a big way. Here’s to hoping he only gets better, and we are treated to more big days from the first exciting young quarterback prospect the Buffalo Bills have had in a very long time.